The MEL-DRAIN TOTAL-DRAIN sheet drain system combines any regular MEL-DRAIN sheet drain section with the unique TOTAL-DRAIN section. In the TOTAL-DRAIN system, the regular sheet drain performs its normal function of water collection, while the TOTAL-DRAIN section provides both water collection and a high-profile section for water flow to the designed drainage exits. TOTAL-DRAIN is a two-part, prefabricated geocomposite drain consisting of a formed 24″ high HIPS core covered on one side with a non-woven, needle-punched polypropylene filter fabric. The top section is 12″ of 7/16″ core for water collection. The bottom section is 12″ of 1″ thick for water collection and horizontal water flow to designated exits. The MEL-DRAIN TOTAL-DRAIN sheet drain system combines any regular MEL-DRAIN sheet drain section with the unique TOTAL-DRAIN section. In the TOTAL-DRAIN system, the regular sheet drain performs its normal function of water collection, while the TOTAL-DRAIN section provides both water collection and a high-profile section for water flow to the designed drainage exits. TOTAL-DRAIN is a two-part, prefabricated geocomposite drain consisting of a formed 24″ high HIPS core covered on one side with a non-woven, needle-punched polypropylene filter fabric. The top section is 12″ of 7/16″ core for water collection. The bottom section is 12″ of 1″ thick for water collection and horizontal water flow to designated exits. The fabric allows water to pass into the drain core while restricting the movement of soil particles, which might clog the core. The core allows the water to flow to designated drainage exits. 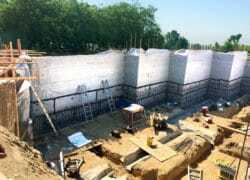 Full-coverage protection is provided to waterproofing materials. TOTAL-DRAIN works with any MEL-DRAIN drainage product. The high-profile flow section has a larger open area than does perforated pipe to accept high flows from the sheet drain and from the surrounding soil. The TOTAL-DRAIN section, with its manufactured transition between sheet drain and high-profile section, provides a secure flow path, which is not dependent on field installation. The system is fast and easy to install. Eliminates select backfill required to give perforated pipe strength. Standard connectors and corner guards are available. 4″ (101.6 mm) wide PERMINATOR TAPE from W. R. MEADOWS. For attaching drain to waterproofing material, concrete, or wood, several methods may be used, including metal stick pins, nails driven through washers or wood lagging, construction adhesives, or double-sided tape. Discuss material compatibility with waterproofing supplier before using adhesive. Typically, any method used for attaching waterproofing protection board will work for drain. For attaching drain to bare earth, 4 – 8″ anchor pins with washers work well. Clean wall and apply waterproofing or insulation if required. Installing First Row … If not using MEL-DRAIN rolled matrix drainage for full water coverage, close the top end of the drain to prevent soil intrusion by folding the fabric behind the drain. Close the high-profile section with PERMINATOR TAPE. Installing Next Roll of TOTAL-DRAIN … To attach the next roll of TOTAL-DRAIN drain, cut one row of low-profile dimples from each end of the two sections to be joined. Do not cut fabric. Interlock one row of the high-profile section and secure connection. Overlap fabric and apply PERMINATOR TAPE top to bottom of joint to prevent soil intrusion. Connecting MEL-DRAIN Rolled Matrix Drainage to TOTAL-DRAIN … If full wall drainage is required, attach MEL-DRAIN rolled matrix drainage above TOTAL-DRAIN sheet drain. MEL-­DRAIN rolled matrix drainage may be installed either horizontally or vertically. When installed vertically, the edge of the core with flange should be facing direction opposite of TOTAL-DRAIN water flow. Fold back fabric at top of TOTAL-DRAIN and rest (or shingle) MEL-­DRAIN rolled matrix drainage on top of TOTAL-DRAIN core flange. Cover fabric seam (facing down) and secure with PERMINATOR TAPE.